Cauliflower and zucchini — two often-overlooked vegetables — have become darlings of the dinner table. As chefs seek to satisfy the growing number of diners looking for lighter, more healthful fare, or gluten- or grain-free options, they are turning to cauliflower and zucchini to serve as veggie doppelgangers for grainy rice and carbo-loaded pasta. “Veggie-carb entrées are popular with chefs and guests today because of the health benefits,” said John Chiakulas, executive chef at Beatrix, a coffeehouse and restaurant from Lettuce Entertain You Enterprises with three locations in Chicago. To satisfy Beatrix’s vegetarian following, Chiakulas offer dishes such as zucchini pappardelle with tomato-basil sauce, fresh mozzarella and grated Grana Padano cheese. “Aside from the obvious health benefits of using a vegetable rather than a spaghetti, the shape of the smaller zucchini forms the most perfect ribbon noodles,” Chiakulas said. On the menu since Beatrix first opened in 2013, Chiakulas said the dish sells very well for a vegetarian entrée. Other dishes that swap veggies for carbs include a wild mushroom braise, smoked beet Reuben sandwich, and mushroom quinoa burger. 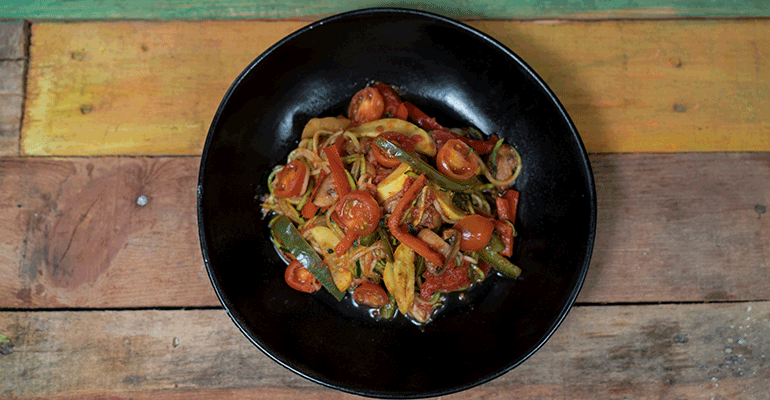 Zucchini noodle dishes have been a runaway hit since they were added two years ago to the healthful side of the menu at SkinnyFats, a Las Vegas-based restaurant with five locations in that metro area. Currently on the menu is Zucc It, a bowl filled with zucchini noodles, eggplant, squash, peppers, mushrooms, cherry tomatoes and arrabbiata, a spicy pasta sauce; cauliflower rice, as a substitute for jasmine rice; and the restaurant’s popular CauliFire, a veggie version of breaded Buffalo chicken wings. 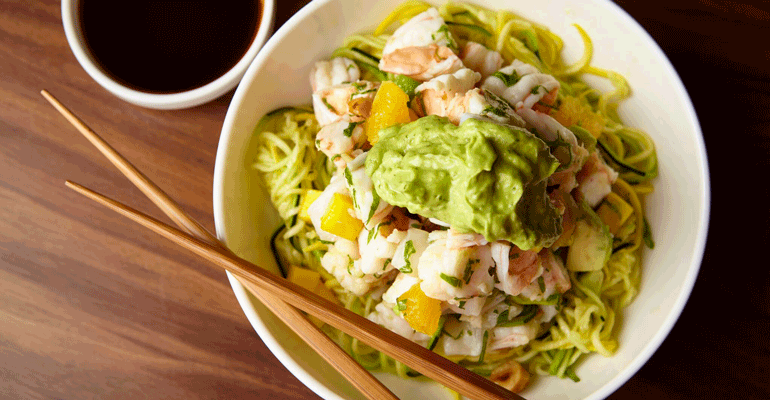 The culinary team at Oceana Poke in New York City also gets creative with veggies in lieu of carbs, using cauliflower rice and zucchini and squash noodles instead of the usual white rice in poke bowls. About 40 percent of poke bowls sold at Oceana Poke are ordered with a veggie “carb” base instead of rice. Since December, Big Bowl, a Chinese and Thai chain with seven locations in Illinois, Minnesota and Virginia, has been offering cauliflower fried rice to diners looking for a low-carb alternative to traditional rice or noodles. 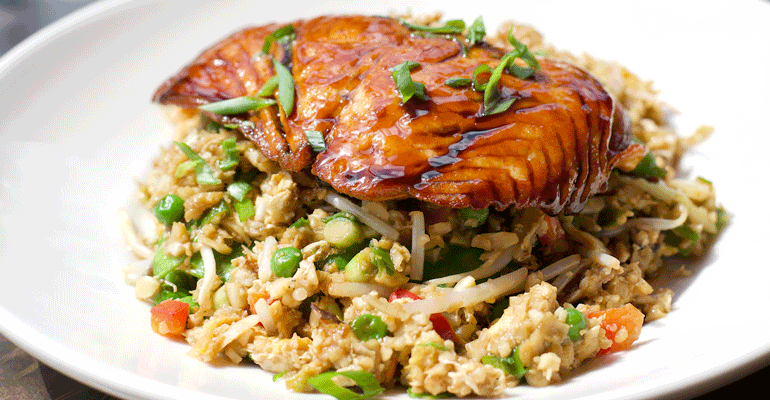 Customers can top the fried “rice” with a choice of protein, such as crispy garlic tofu, teriyaki chicken, slow-roasted barbecue pork or soy-glazed Atlantic salmon. Steamed cauliflower rice is also available as a side with any entrée. Similarly, in February, Chicago-based Wow Bao, a Chinese steamed bun chain from Lettuce Entertain You Enterprises with 10 units, launched cauliflower rice as a base in all of its entrée bowls. The cauliflower is riced and steamed with gai lan, or Chinese broccoli, which gives the rice a green color. Thai curry, orange chicken and BBQ Berkshire pork are among the topping options.